See the designer's favorite picks from Target's new Threshold collection! 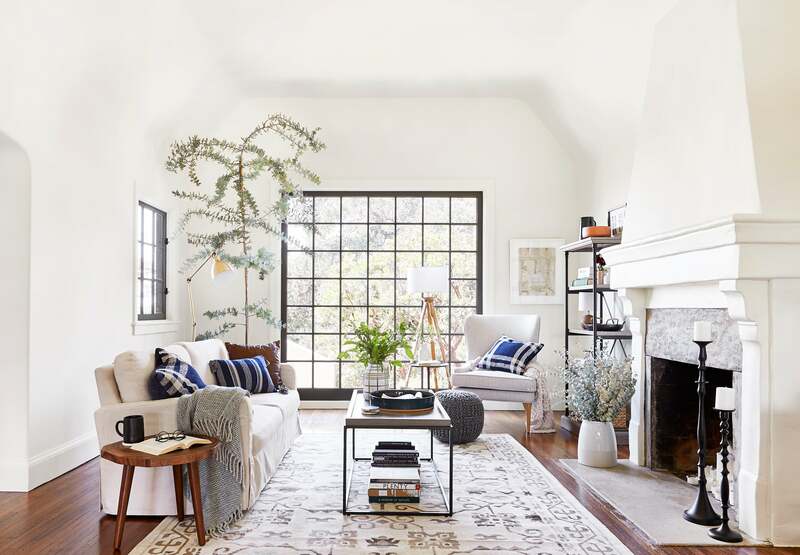 The best way to get into the spirit of a new season should, arguably, entail a refresh of some sorts—and our interiors instantly come top of mind. Lucky for us, we can always count on our friends at Target to serve us up with a constant rotation of fresh items and design ideas. Here, we’re looking to the retailer’s brand new Threshold collection, which boasts an inspired array of decorative accents and essentials bearing the series’s signature aesthetic that combines traditional design with a hint of modern industrialism. We managed to get a sneak peek of the new line ahead of its forthcoming reveal (it will be in stores and online beginning September 16) courtesy of interior design style maven Emily Henderson. Armed with a slew of her favorite pieces from Threshold, Henderson transformed a living and dining room space to showcase the versatile and style-focused nature of each one of the pieces. We caught up with Henderson to get the lowdown on the new line and even managed to snag a few helpful styling cues from the interior design guru herself. Take a look. Deeply rooted in nature, the collection is comprised of pieces that emulate the inspired elements of the current season, a quality that instantly drew Henderson to the line. “You’ll notice plenty of pieces with natural colors and authentic materials, like wood, ceramic and glass, that all help add warmth to a room,” she notes of the line’s embodiment of the quintessential spirit of autumn. To complement that, a fresh slew of chunky knits and rustic accent pieces that further contribute to the cozy and inviting nature we’re all so desperately seeking in the coming season. In Henderson’s own words, the aesthetic of the line is one that gravitates towards the timeless with an effortless integration of contemporary elements that contribute to currently-relevant feel. “The black side table we used is neutral enough to work in just about any space but features a cool sculptural base that keeps it interesting,” says Henderson of the collection’s ability to remain on-trend for many years to come. It’s safe to say that decoratively speaking, fall and layering essentially go hand in hand. And for good reason—as the weather cools and the inevitable chill sets in, nothing quite compares to cozying up inside amidst a thick bundle of woven textiles—preferably in front of the fire with a good book and hot drink in hand. So when it comes to readying your home for said practice of hygge, there are a handful of elements to consider. For those beginning with a blank slate, Henderson advises establishing the foundation of the room with larger furniture pieces that come clad in a neutral scheme. “The wingback chair is timeless and comes in a soft, muted gray that works so well for layering,” she notes. To complement the traditional character of the piece, Henderson paired the chair with an “edgy” detail, which came by way of the sleek, black coffee table for a modern touch. Natural wood accents, vibrant greens, and a pop of color courtesy of the blue plaid throw pillow were added to seal the deal. The (arguably) most important decorative element to consider for fall? It’s all about texture. “I love patterns, both bold and subtle, and enjoy experimenting with different materials,” says Henderson. “Incorporating soft textures through rugs, pillows and upholstered furniture helps make a room feel warm and inviting.” Going beyond that, Henderson is a proponent of the integration of greenery, as well as decorating with pieces that factor in a natural element or two: wood and sandstone come at the top of her list. As for Henderson’s favorite pieces from the new collection? It’s all about that classic chair. “I’ve already mentioned how much I love the wingback chair, it is by far my favorite piece in the collection! It is so good,” she exclaims. We’ll be taking Henderson’s words of wisdom straight to Target to stock up on these cozy, fall classics. The new Threshold collection will be available online and in stores September 16th. Can’t get enough? See more of Henderson’s on-trend styling tips below!